This spring, we went in search of the world’s ninth-best beach. We found it, too. 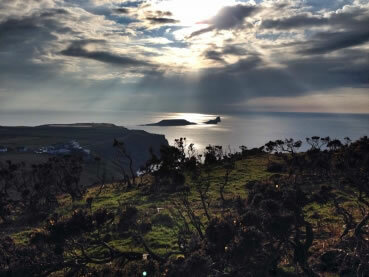 Read about our trip across Gower’s hills and beaches on the blog. For our July to September prize draw, we’ve teamed up with Ordnance Survey who have provided a fantastic prize. One lucky winner will win a custom-made OS map, a 12-month subscription to their online GetAMap mapping and an exclusive OS rucksack. More details can be found on our website. To enter, submit a walk before the end of September 2014 (and remember, you can submit more than one walk for a greater chance to win). A big thank you to PoliMil for providing prizes for the last prize draw. Ten Snugpack 500ml aluminium water bottles are on their way to the winners. The National Parks can get full during the holidays. If you prefer a bit of peace and quiet on your, why not try the Howgill Fells? Squeezed between the Lake District and the Yorkshire Dales, you can often have these tops to yourself, even on a summer’s day. There are several good routes from Sedbergh, including this day trip to Arant Haw via Cautley Spout. It’s summer, it’s the walking season and our much-improved GPX walk-editor is up and running. You can still use the normal walk editor, but anyone using a GPX can also upload a GPX-file and let the editor work its magic (you will just need to add the waypoint details). Just click on "Create GPX-Walk" and follow the instructions. The next newsletter will be out in October. Please send us any news and until then, happy walking!